Rick Cordeiro – (The Collapsed – 2011). Hey Rick. Thanks for taking the time out to talk to me about your new film, ‘The Collapsed’. Hi Matt. Thanks for the interview. ‘The Collapsed’ is a film about a family who desperately try to survive and escape the city in the wake of the end of the world. The danger posed by the other survivors are the least of their worries. Do they survive? You’ll have to watch the film. I play a survivor and sentry named Ben Craven who holds one of the other survivors hostage in a barn. Eventually I get killed in a fight by the lead character played by John Fantasia – this means I’ve now been killed on TV/film a total of 18 times. I met director Justin McConnell three summers back in Toronto at a networking event, gave him my business card. I knew there would be other film makers there in attendance and met dozens there that lead to more work on other productions. One year later Justin contacted me and told me about a part in the film he thought I’d be good for. I’ll say there’s a unique ending to the film that some might not expect. That’s all I can say. The film stars John Fantasia, Steve Vieira, Anna Ross, Lise Moule, Vincent Thomas and Stefano Gallo – with Justin McConnell on board as director – what was it like working with the cast and crew on-set? Any good anecdotes? Very talented cast and crew. Justin was great. He knows how to get things done and move things along at a good pace without making you feel like you’re being rushed or pressured to move it along quickly. Knows what he wants and gets it done. During each take of the fight scene I had with actor John Fantasia he popped me in the nose pretty good. First time it happened I was told it “was an accident” but it happened again two more times. I was ready to kill him with a shovel by the third time. Let’s talk a bit about you Rick. What made you want to get into the industry in the first place? I got into this crazy business by accident in the summer of 2004 when a friend of mine back in my hometown of Hamilton, Ontario introduced me to two lady friends who ran an agency for background performers. I did not want to join up at first, he literally dragged me into their office. The very next day they had me working in Toronto on a feature called ‘The Perfect Man’ starring Heather Locklear and Hilary Duff – (I even got to see STYX perform “Mr. Roboto” on set). That first day I was selected out of 300 extras do work a scene with Heather Locklear. The producer Mark Rosman told me “I was the Bumper Boy” which meant I had to bump into Heather Locklear after she bought her beer at the bar and make her spill her beer. So I got an upgrade on my very first day. I waited a whole year for the film to finally be released only to find out the scene did not make the final cut. But it was because of this first day experience I decided to stay on working on film shoots past that first day. I was upgraded on a dozen more productions after that which lead me to decide to pack up my bags and move to Toronto from Hamilton (on Boxing Day, December 26th, 2008) to pursue a career as an actor (principal speaking roles) and in that time span – (2008-2012) managed to pick-up work on over 160 TV and film projects. First and foremost don’t be in such a hurry to join up with the Union. Most of the work out there is non-union and you need to work on all the non-union stuff to gain valuable work experience, build up your resume and pick-up demo reel-worthy material. Once you join the Union you can’t work on the non-union stuff and here in Toronto, Canada 97% of the stuff is non-union. As a non-union actor though I can still work on the Union gigs but if I don’t want to join the Union I can easily buy a work permit from ACTRA (Union) which allows for me to work on the Union project and continue staying non-union afterwards. Sometimes you get really lucky and the production will pay for your permits too. This happened to me on the set of ‘The Kennedys’ where I was cast to play a 1960’s Chicago gangster and Sam Giancana’s goon. Got to work with actor Tom Wilkinson and director Jon Cassar on that one. You’ve had a number of roles in different film and TV projects – which actors/actresses have been your favourites to work with so far and why? Any good stories? I’ve had the great pleasure of working with many talented actors. Hard for me to pick just one. I’ve been extremely lucky and blessed in that regard. Also many young talented actors I’ve worked with have given up and left the Biz. They got tired living the life of a gypsy. The life of an actor was not for them. Many folks out there don’t realize new actors work on films at the start of their careers that are low or non paying gigs. We do it for the experience. Even had a lady friend of mine on Facebook asking me to get her a role on one of my films because ‘she was a single mother and had three kids to feed’. I told her to forget about the acting biz and go out and get herself a “real job”. (a) AL CAPONE: I get cast plenty to play gangsters and mob bosses. 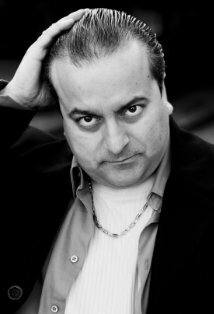 Some of the casting directors in town refer to me as “The Al Capone of Toronto”. (b) JOHN BELUSHI: I currently take classes at Second City Toronto. Some of my class mates tell me I remind them of the late John Belushi. I do a lot of comedy as well. (c) JAMES CAGNEY: I like watching the old movies on Turner Classics. I watch and study James Cagney very closely. When I watch a James Cagney film I’m in acting school. Portugal: The birthplace of my parents. My father from San Miguel Azores. My mother from the Madeira islands. Previous Chris Newman – (The Five-Year Engagement – 2012). Next Joao Gerundo – (Rock Of Ages – 2012).